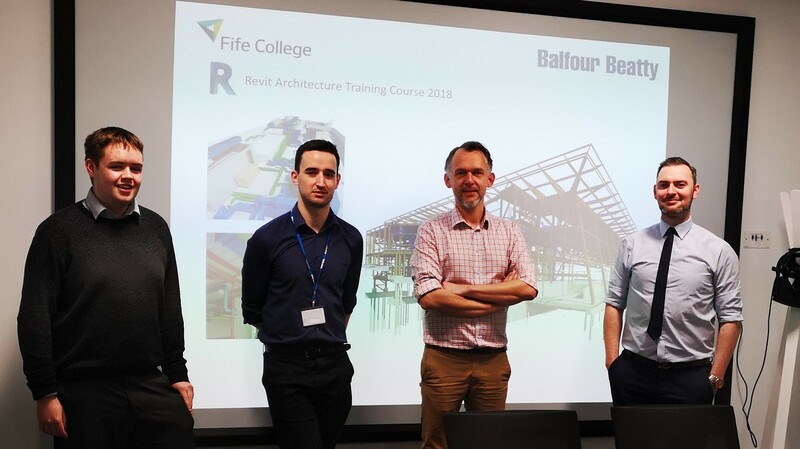 Fife College has been showcasing its industry-leading credentials by running an innovative training programme in partnership with construction firm Balfour Beatty. The three-day course in AutoDesk Revit – a fundamental computerised modelling tool used to plan, design, construct and manage buildings – was held at the College’s Stenton Campus in Glenrothes and culminated in an Autodesk Revit Architecture Certified User exam for delegates held in Fife College’s Certiport Assessment Centre. The link up with industry provides the College a platform to promote its commercial and innovative capabilities – and is part of a wider plan to work with more local businesses to help with their training needs. The 10 Balfour Beatty employees received in-depth training on a range of digital construction skills – with a certified user exam at the end of the three days. Balfour Beatty is involved in some of Scotland’s biggest construction projects, including building the £24 million Glenrothes Energy Network in Fife.